Calling all the Ques in the United States Virgin Island and all around the world. This tag is available to everyone as well but can only be registered for official use in the U.S.V.I. Eta Iota Iota has been approved to sell this one of a kind license plate to all who make a donation of $100 dollars or more. 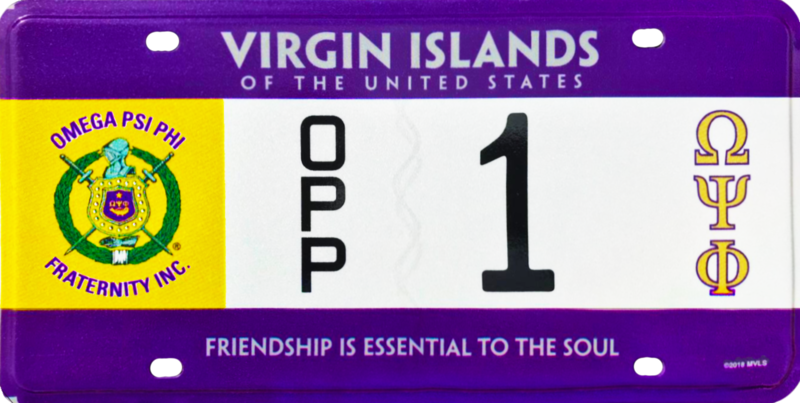 The tag is authorized for registration for Omega Members only in the USVI but available as a memento or souvenir for all others who care to donate. You can make that donation now by clicking the link below. We will contact you for shipping instructions after confirming your donation within 24-48 hours. The project team lead for this action is Brother Abramson who can be reached by using our "contact us" link. Send all inquires to this activity to our 'contact us" link for an immediate response. Welcome to the official website of the Eta Iota Iota chapter of Omega Psi Phi Fraternity Incorporated. Brother Rick Mullgrav (Beta Psi 1983,) is the current Basileus of the chapter affectionately known as The Cruzan Ques among fraternity brothers, friends and followers. We are currently the second chapter established in the United States Virgin Islands. Our sister chapter Zeta Xi calls St. Thomas home. We proudly boast a diverse membership that represents a mix of territorial government employees civilians, active duty, reserve & National Guard, and retired military fraternity members. Our official location is St. Croix and we claim both Fredriksted and Christiansted towns in the beautiful Caribbean Islands also known as the Danish West Indies. Omega boasts a number of chapters outside the continental United States and we are considered a member of the fraternity's 13th District of which all non-continental US chapters resides. We work hard to "Live Our Creed" Manhood, Scholarship, Perseverance and Uplift are our guiding principles as prescribed by our founding fathers and affectionately called our Cardinal Principles in the words of Omega. In keeping with our aims to improve the lives of Black People, we are determined to carry out the mandated programs enhance these efforts with chapter initiatives to support the specific needs of the Caribbean. The value of our fraternity is not in numbers but in men, real brotherhood. Eight Men Thoroughly Immersed in the True Omega Spirit are far greater than 80 with lukewarm enthusiasm . The brothers of Heta Iota Iota Chapter are spearheading an initiative to establish a chapter of the National Association for the Advancement of Colored People on the island of St. Croix. The plan is to recruit one hundred card carrying members. If you are already a member of the organization and want to join in on the effort, please contact the chapter to have your name added to the list. The is a chapter charter mandate and we must have 100 members before appealing to the NAACP for support. We’re making it easy so follow this link to join the NAACP and contact us at (Click Here) the chapters website Contact Us Page (Click Here). Once we receive notice we send information on upcoming events and actions associated with this chapter charter initiative. This is an unprecedented action for the island of St. Croix in our beautiful Virgin Islands and we want to see you make a difference. Again, we need your help and the first step is to join the NAACP. We challenge all local Greek chapters to get onboard too. Annual memberships start at $30 and the life membership fee is $750. Life member fees can be paid in installments in accordance with NAACP guidelines. Your payments will go directly to the NAACP national headquarters. The hyperlink below simply takes you to the NAACP HQ website. HII is not collecting money for this effort on our site. Spread the word that Omega is back in business. Thank you for your support during this the 2017/18 annual Festival too. We look forward to serving you and making a difference in the community.